This line from the musical (and documentary) Grey Gardens resonates strongly with me. In fact, to me it so effectively captures the overarching theme, I feel it should have been the main inspiration for the musical Grey Gardens. In its current form, the show is sadly disappointing. Seeing this musical for the second time, first on Broadway and then in this great production, made it very clear that this show could be so much more. The problem mainly stems from the disjointed first and second acts that seem as if they were written by two different teams. In the first act, it’s 1941, with Edith (“Big Edie”) planning a party for the announcement of her daughter’s (“Little Edie”) engagement to a Kennedy. Things don’t go as planned, resulting in vague foreshadowing of what’s to come. The second act fast-forwards 30 years, with mother and daughter having become eccentric recluses living together in squalor. Essentially, it’s the documentary with music — including a few KILLER numbers. I know the idea isn’t new, but Jamie, Steven and I all agreed that we wish someone would rework the show using the first act’s storyline as flashbacks – much like the concept used in Sondheim’s Follies – slowly revealing the history of these two women. You know, blurring the past and the present. The creators seemed to play with this idea, as actors from act one do randomly appear as memory ghosts, or cats, or a gospel choir (? ), in act two, but the result is more confusing than anything. A wasted opportunity. I think when I saw it on Broadway, the show’s flaws were masked by Christine Ebersole’s and Mary Louise Wilson’s blazing performances. In this production, the performances weren’t at that level (just yet), which magnified the problems. Why am I spending so much time discussing how to fix this show? Because I love the score and the subject matter so much, I want MORE. It hurts my heart, a little bit. 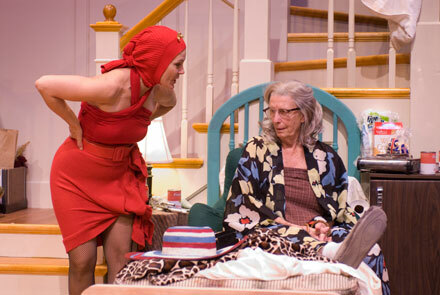 Anyway, Northlight has done a VERY admirable job with the Midwest premiere of Grey Gardens. We caught the sixth preview – opening night is next week. I’ve never been to Northlight, and, much like my experience at the Court Theater last month, I was very impressed. It’s a great venue with a thrust stage – not a bad seat in the house. That said, we did sit FAR right (or stage left?) of the stage, which resulted in lots of singing backs. So, not a great seat, but we were only six feet from the actors at certain points. Production values were on par with the Broadway production. 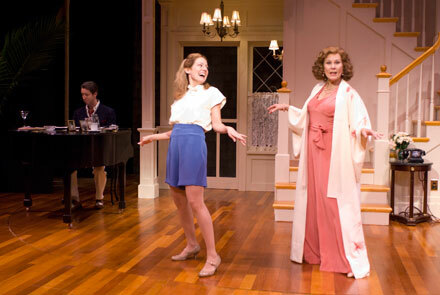 The set featured a mini-recreation of a two-story Grey Gardens on a rotating stage, which would spin to take us inside or outside, depending on what the action called for. The band, conducted and arranged by the impeccable Doug Peck, was ok. Peck was in charge of music direction for Caroline, or Change at The Court, and I preferred his work there. The reduced orchestrations, which included the omission of the French Horn, were a little too piano heavy for me. And they were sequestered to backstage, which made the music sound muffled. Costumes were outstanding. Little Edie’s act two costumes were actually more faithful to the documentary than the Broadway production. They had a more hand-made quality to them, where you could actually see that her head wraps actually used to be sweaters, or towels, or whatever, in a former life. The strongest performance came from Tempe Thomas, who played Little Edie in act one. She struck the perfect balance of playing the “daddy’s girl” role, but then losing it completely when arguing with her mother – including the iconic hands behind the back pose and the pacing. She also had a crazy look in her eye, which was a little frightening. Brava to her. Hollis Resnik. Oh, she’s giving one hell of a performance. I think in a few weeks it will be a great performance. Although, it’s not quite there yet. This being only t he sixth preview, I sensed some trepidation in act two. But, in act one, she owned the stage. Hollis is comfortable playing leading lady roles in period dresses. And, unlike Ebersole, her act one performance was in line with her act two counterpart in terms of voice, carriage and style. In act two, I think she actually gave a more accurate portrayal of Little Edie than Ebersole did. It was a quieter, more introverted Little Edie than Ebersole’s. According to her bio, she just completed the role of Blanche in A Streetcar Named Desire at the Cleveland Playhouse, and I could see a bit of this character in her Little Edie. She also has the pacing thing down – not unlike a caged animal wanting desperately to escape from Grey Gardens. She did a great job with her two big numbers – “Around the World” and “Another Winter in a Summer Town.” However, the woman sitting next to me decided to refrain from hacking until these two numbers. ARGH! “Revolutionary Costume” was a bit too low-energy for me. Ann Whitney as “Big Edie” sounded just like the real Big Edie. Great performance. Very touching. She just needs to SING OUT – I could barely hear her over the band in her two numbers. The audience was dead and barely laughed or responded to lines that stopped the show in New York. I think this has more to do with the blue-haired subscriber-based crowd who were just very confused by it all. But something was very bizarre seeing Hollis walk through the screen door in her full getup at the top of act two, and NO APPLAUSE. I think the actors need time to grow into these roles to truly let this show shine, which I’ve no doubt will happen shortly. Go see this show. Small correction, “Another WINTER in a SUMMER town”. I wonder where you were sitting in the Broadway production, because I was very close to them and could see that the headwraps were sweaters that were twisted, sewn, and pinned together. Very authentic looking to me, but perhaps from a far they looked theatrical. Oops. Thanks Katie. That’s what I get writing a Blog post early on a Monday morning. I also meant that Ann whitey sounded like big – not little – Edie. As for the costumes, ivey longs costumes just seemed a little more theatrical than this production. Hmm. I am seeing this on Saturday. I saw it a few times on Broadway as well and am looking forward to seeing what Northlight does with it.